Michael Sopkiw plays Parsifal, a guy who loves racing cars around the Arizona desert and basking in the love of his fans for beating his opponents on the post-apocalyptic racing circuit. But his world is interrupted when he’s summoned to a secret base by The President of the Pan-American Confederacy (Purdom). He’s informed that he must break into New York City - which is controlled by deadly gangs called the Euraks - to rescue a woman from their clutches who can perhaps help to replenish the depleted population of earth. He also gets assigned two helpers: Ratchet (Puppo), who’s supposed to be one of the strongest men left on the planet, and Bronx (Scalondro), a man who has memorized the map of New York. During their mission, the three men meet tons of trials and tribulations, not the least of which is New York’s serious rat problem. They meet many wacky characters along the way, such as Big Ape (Eastman). Will they get out of NYC alive and save the world? Find out today! Despite being the pride of our home state, Connecticut, Sopkiw starred almost exclusively in Italian productions. 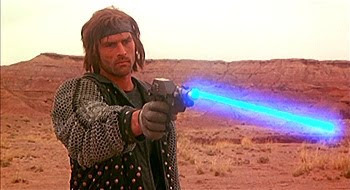 Between 1983-1985 he appeared in 2019, then did two movies for Lamberto Bava: Blastfighter (1984) and Devil Fish (also 1984), then one more for Michele Massimo Tarantini, Massacre In Dinosaur Valley (1985) then all but disappeared. Just more evidence that the 80’s was awesome - Italian productions were flourishing, and stars like Sopkiw had venues to flower and we got to know them all through our local video stores. Sadly, that time is over, but gems like 2019 provide much-appreciated artifacts from that golden time period. 2019 appears to be the result of Sergio Martino throwing his hat into the then-hot post-apocalyptic genre. The movie has all the insane outfits, wonderfully decorated sets, innovative weapons and vehicles with crazy crap glued to them that any Italian post-nuke movie would have, and that fans have grown to love and have become accustomed to. Of course that includes flamethrowers and “Pew Pew” lasers. These movies were primarily meant to entertain, and 2019 completely succeeds. It has the ultimate coolguy for a hero, plenty of wild situations intermixed with brutal violence, and the time-honored innovations we often talk about, ensuring an 80’s Video Store Classic. Speaking of video stores (though when aren’t we? 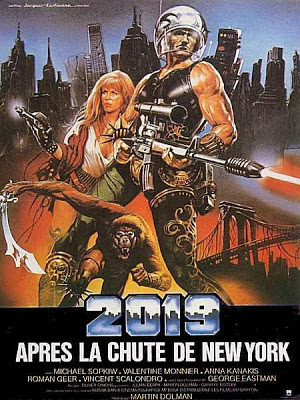 ), when 2019 was released on VHS by Vestron, they dropped the 2019 and just went with After the Fall of New York. Could this be because they wanted to bring the similarities to Escape From New York (1981) front and center? Nah. Can’t be. But then Joe D’Amato’s 2020 Texas Gladiators (1984) presumably picked up where this movie left off? Regardless, the Guido and Maurizio DeAngelis music (using their pseudonym Oliver Onions) is typically solid and appropriately synthy and futuristic. Their soundtrack to Street Law (1974) is hard to beat, but this one is a winner as well. The Media Blasters DVD is a must-own if you’re into the Italian post-apocalyptic genre. It looks great in widescreen and even has an intro from Michael Sopkiw. We recommend it. Also check out write-ups from our buddies: RobotGEEK, The Video Vacuum, and Trash Film Guru! Good stuff, I'm a fan of the film (and the sub genre in general) as well. This is definitely one of the better entries in the genre. We definitely agree. Sopkiw at his best. We have New Barbarians\ Gladiators dropping next week. Yeah, this is probably my favourite Italian rip-off sci-fi movie. Great pacing, fun costumes and sets, lots of action. It "borrows" a hell of a lot from Escape from NY! I love the opening shots - miniature model work of New York. It's not convincing at all but I appreciate them trying their best. Can't agree more. The model work is great...it makes you get into the spirit of the movie right away. I third Jack's comment about the fantastic models. A post-apocalyptic movie should always have models and matte paintings. This is one of the best Italian post-apoc movies, one of my favorite genres. It's time for the Italians to wake up and make 2021 before we reach that year. Definitely agree. The Italians have to make a sequel...it's not too late. Sopkiw is still alive.